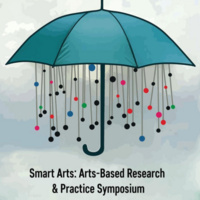 Poster presentations and performance demonstrations featuring more than a dozen scholars and artists, or “scholartists,” will showcase their work at the The Smart Arts: Arts-Based Educational Research Symposium, hosted by University of Georgia College of Education Professor Melisa Cahnmann-Taylor. Dr. Melisa Cahnmann-Taylor presents poems from her first collection “Imperfect Tense” reflecting interviews with North Americans studying Spanish in Mexico and poems from her current manuscript, “Don’t Drink the Water,” reflecting on a range of intersections between the languages we speak, the cultures we create, and the people we become. Rhia Moreno will present More than “Pasta, Meatballs, and Wine”: Using Arts-Based Inquiry in Study Abroad, which focuses on arts-based pedagogies to deepen students’ considerations of cultural nuance and variability in a summer study abroad program in Italy. The objectives for this project were to engage students in active and critical inquiry on cultural topics through their own arts-based research and to study the impact of their art-making on their cultural understanding and growth. Bokyoung Jo presents "Take Some Time? : A True Piece of Advice or To Draw Your Own Story" through Visual Self-Inquiry in the form of drawings, Bokyoung shares her experiences adapting to life as a new first-semester graduate international student in the US. Sahar Aghasafari presents An Autoethnographic Journey of her identity as a Persian Artist in the U.S. Through Graphic Story by incorporating autoethnography to study her identity as a Persian artist in the US to express some of the challenges faced by international artists trying to introduce their work to a new society. Heather Silver presents “Teaching Beyond the Rainbow: A Naturalist Field Guide and Handbook of Reflections, Collections and Truths of an Elementary Art Class” as an arts-based research exploration of the (un)natural environment of her school setting. Photography and autoethnographic narratives are a bridge to current Ecojustic trends and the reflection of a modern Western industrialist culture in an American public school. Ajit Bhattarai presents“Theory through play”, a short play focusing on some of Michel Foucault’s concepts. Reading high theory is notoriously difficult, even more so for non-traditional graduate students like Ajit who do not have prior exposure to Western philosophical concepts. Based on his own struggles in reading theory and highly influenced by qualitative researchers using different writing genres in making their work accessible to a larger audience, this play is an exemplar of an on ongoing attempt to make theory more accessible to first time readers of theory. Cathi Warren presents “Asking LGBTQ Students to Help Me Make My Art Classroom ‘Safe,” where she explains her work to promote a safe and supportive atmosphere for LGBTQ students, where students are judged only for their artistic talents, not their sexual or gender orientation. She explores these themes more personally through experiences shared by her transgender son as he comes into awareness of his identity, struggles with the realities of an unaccepting society, and ultimately finds safety and support in his close relationships with his friends. Susan Lane presents “Recess Play, Past and Present: An exploration of the nature of free play in schools” through an eight minute theatrical happening, which includes dialogue directly gathered from ethnographic interviews that reflect on the importance of play in their childhoods, their own children’s lives, and this present moment. Amber Pitt presents “Really, Why? Exploring the borderlands of parental school choice” where she asks questions to further understand what factors influence a parents decision regarding their child’s education in the Athens-Clarke county area. Through interviews and artful interpretations, she inquires into the ethics of school choice. Alex Winninghoff presents “What slips beyond definitions of trauma in trauma-informed schools?” where she uses creative writing and prose to express the divergence between what can be understood through contemporary psych field definitions of trauma, and that which can be understood more personally through the lens of first person narrative. Haille Perkins presents “Trigger Warning,” an autoethnography of her experience as a Black woman Citizen, processing the trauma of racial incidences in the country as described in Claudia Rankine’s book of poetry Citizen: An American Lyric. Through collage, she represents the trauma that is endured from constant racial triggers. Danelle Chamberlin presents “The Reconceptualized Classroom” where she explains how teachers and teacher candidates conceptualize the impact that the classroom environment has on elementary school students. Through interviews and the creation of classroom decor and furniture she explores what classrooms could look like without regulation.